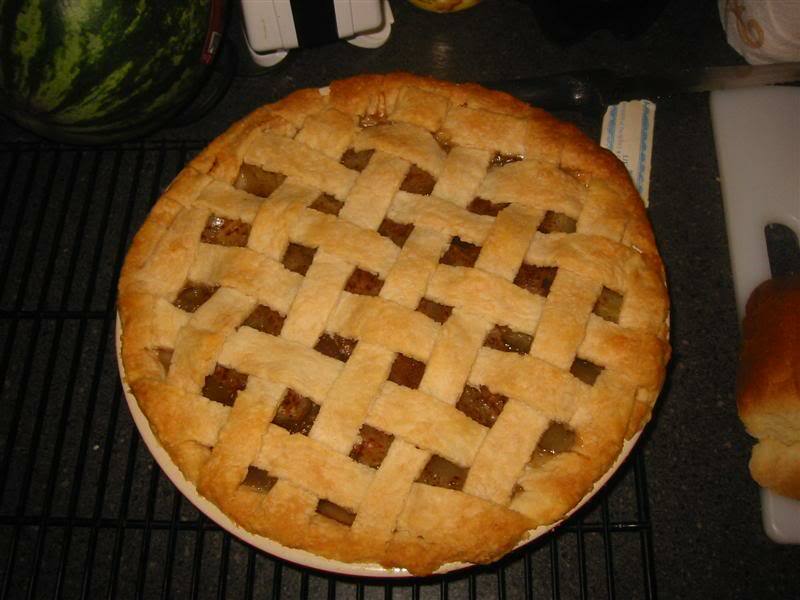 A lattice crust is a top crust that looks like the crust has an open weave. These days you can buy a template to cut the top crust to look like it’s a lattice crust. But, you can also do it the old fashioned way. You start with making simple pie crust for a two crust pie. Roll out the top crust and fit it into the pie pan like normal. For the top crust, roll it like normal and take a pastry cutter and cut the crust into strips about 1/2″ to 1″ wide. Fill the bottom crust with your filling. Now to start your lattice top crust, lay the strips across the pie, spacing them apart how you like. Now, fold back the strips of every other one half way. Lay a strip of pastry across the strips that are over the pie. Roll back the pastry strips that are stretched out. Stretch out the strips that had been rolled back at first. Lay another pastry strip across the pie. Repeat those steps til you have half the pie complete. Now, roll back half the strips on the other half of the pie and follow the steps above. You can criss cross the pie how many times you want. If you want the lattice closed, put the strips really close together. If you want it wide open, space the strips wider apart.